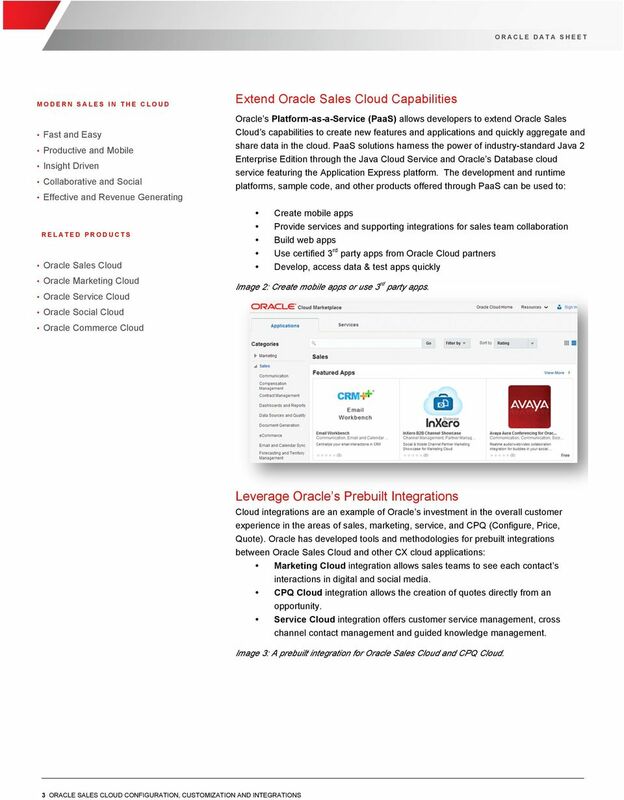 Download "Oracle Sales Cloud Configuration, Customization and Integrations"
1 WINTER 15 Oracle Sales Cloud Configuration, Customization and Integrations Oracle's standards-based, open and flexible platform makes it easy to rapidly build and deploy rich applications or integrate with and extend Oracle Sales Cloud. 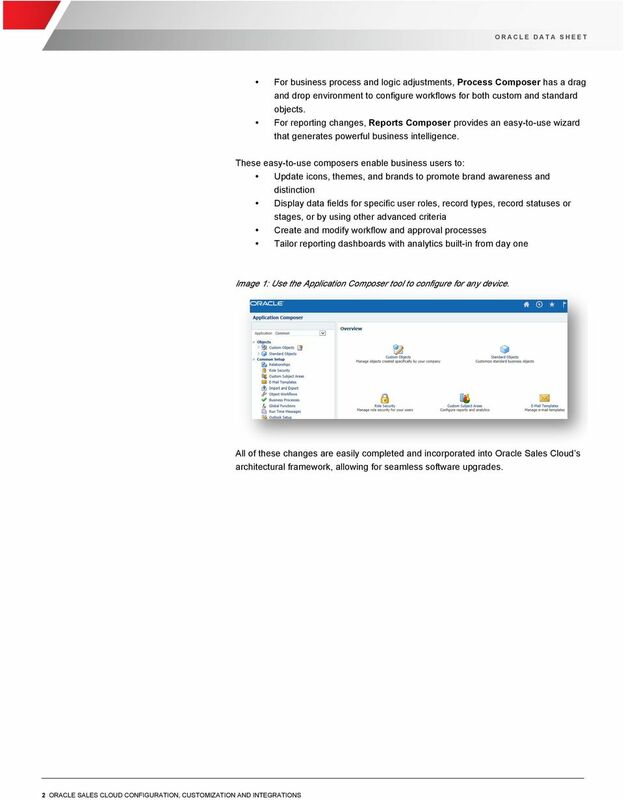 Oracle s configuration and customization toolset enables business users to tailor for Software-as-a-Service (SaaS) to meet the unique needs of each business. 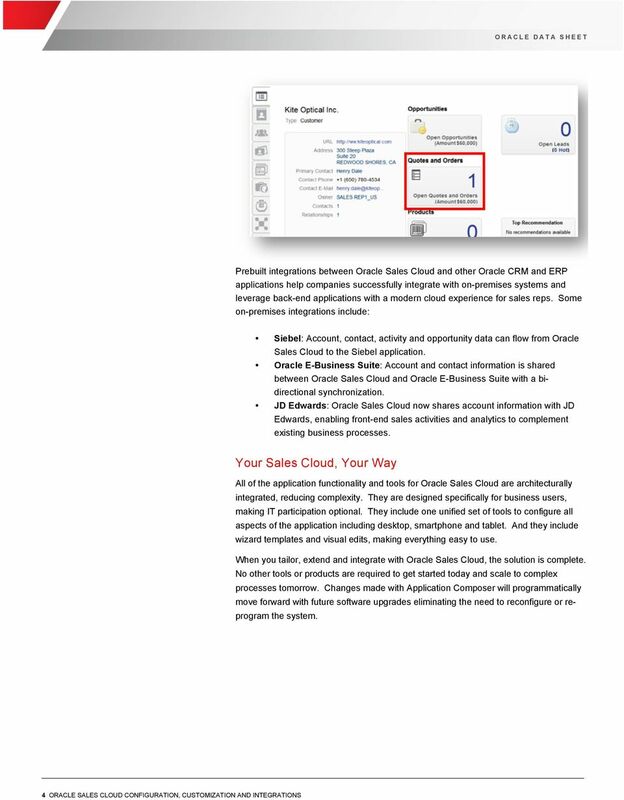 Oracle s Platform-as-a-Service (PaaS) solution provides KEY FEATURES Application Composer Process Composer Oracle s Platform-as-a-Service (PaaS) Cloud Integrations Cloud to On-Premises Integrations development and runtime platforms that can be used to enrich and extend the Oracle Sales Cloud solution and offers products to enhance sales team collaboration. Prebuilt cloud and on-premises integrations offer complete solutions for sales teams. 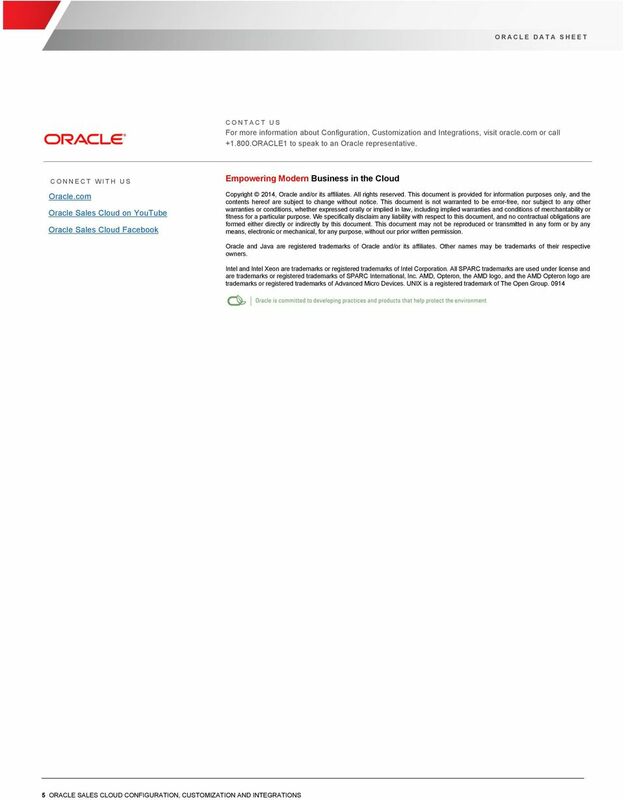 Improve User Experience with a Personalized CX Cloud KEY BENEFITS Improve user experience Increase user satisfaction Protect tailored changes across software updates Extend capabilities to create new features and applications One cloud platform with standards-based tools Tailor for your Business Needs Oracle recognizes that each business is unique and modern sales teams require a user experience that is tailored for their needs. 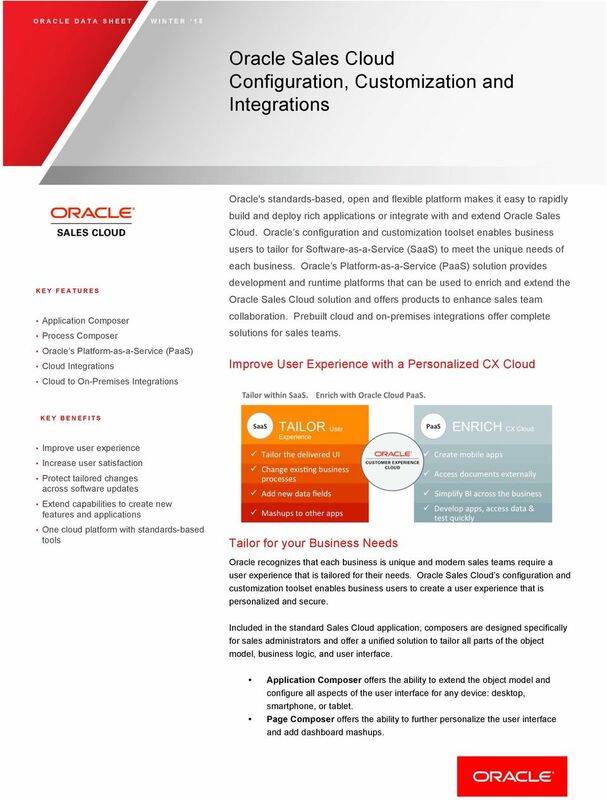 Oracle Sales Cloud s configuration and customization toolset enables business users to create a user experience that is personalized and secure. Included in the standard Sales Cloud application, composers are designed specifically for sales administrators and offer a unified solution to tailor all parts of the object model, business logic, and user interface. Application Composer offers the ability to extend the object model and configure all aspects of the user interface for any device: desktop, smartphone, or tablet. Page Composer offers the ability to further personalize the user interface and add dashboard mashups.